Chick-fil-a's 2nd annual Cow Appreciation Day promotion will take place next week. Chick-fil-a is offering a free combo meal (breakfast, lunch or dinner) to any customer who visits one of its restaurants fully dressed as a cow on Friday, July 14. 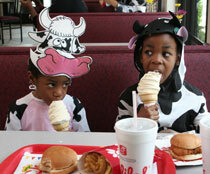 So go ahead... dress up like an cow and chow down for free. Despite Cow Appreciation Day being an 'unofficial' national holiday for years, last year was the first time Chick-fil-a tied the holiday to their “Eat Mor Chikin” Cows marketing campaign. Cow Appreciation Day is coming soon – July 11th! Get your cow costumes ready for the big day and head to Chick-fil-a for your FREE sandwich or meal (full cow costume gets you a meal, partial cow gear earns you a sandwich). Need inspiration for your costume? Simply darken your nose and/or mouth area with face paint/make-up to simulate a cow nose and wear horns/ears with this look. Careful not to smear your makeup while downing your free sandwich. The Chick-Fil-As in Orange County, CA are having a customer appreciation week. The two times I visited, it was a disaster. Long lines, running out of the promotional item, and very poor service. Basically customers treated like deadbeats by staff, not the usually excellent and polite service this chain is known for. Such promotions are better done with coupons.